1. 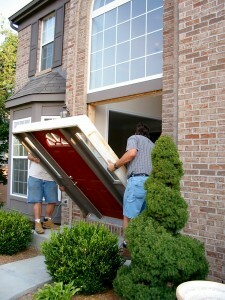 Drafts are an obvious sign that a door needs to be replaced. When the seals around a door age, they can shrink and even crack over time. If you’re wondering why your house gets so cold at night, check each of your entry doors around the house for cold air leaks. 2. Squeaky hinges are a cry for help! Maintenance and oiling can only do so much for aged hinges. 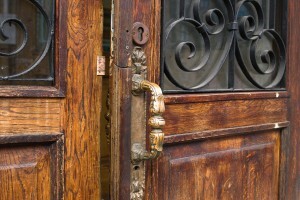 Worn hinges indicate that the actual door may not be in working shape much longer either, and loose hinges mean your door could easily be forced open. 3. If you notice visible cracks in your front door, you shouldn’t wait another day to call the home improvement experts at Gerald Jones Company. Not only do cracks let in pesky bugs and drafts, but this means your old door is structurally weak, which poses a serious safety concern for you and your family. 4. If your entry door scrapes the floor or if it requires serious muscle to open or close it, it is time for a new one. Old doors can warp, swell or sag, causing damage to your floor every time you pass through the doorway. Patio doors that scrape or stick in their tracks should also be checked. 5. Your door is out of style. If guests compliment the “vintage” look of your front door but that wasn’t your intention, it may be a sign you need to bring your door up to date with a more modern look. Upgrading your front door is one the simplest home improvement decisions, and offers plenty of bang for your buck, with steel replacement doors recouping up to 140% of their cost in the Chapel Hill area! “Just had a new front door installed by Gerald Jones! 1st class job… quality craftsmanship with installation. Everyone from Todd to the young man who installed our door – very professional people! If you need any type work done – don’t waste your time getting several bids… Gerald Jones Co. will give you a great job with a fair price!” – David R.
This entry was written by Gerald Jones Company, posted on February 17, 2016 at 5:02 pm, filed under Uncategorized and tagged door upgrade, entry doors, front doors, home improvement, home remodeling, replacement doors. Bookmark the permalink. Follow any comments here with the RSS feed for this post. Both comments and trackbacks are currently closed.